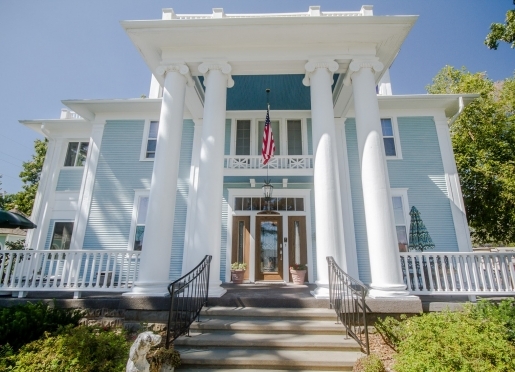 The Dickey House, a lovely and gracious Greek Revival mansion and now a Missouri bed and breakfast, was built at the turn of the century by Samuel N. Dickey, a prominent prosecuting attorney, and it remained in the family until 1970. 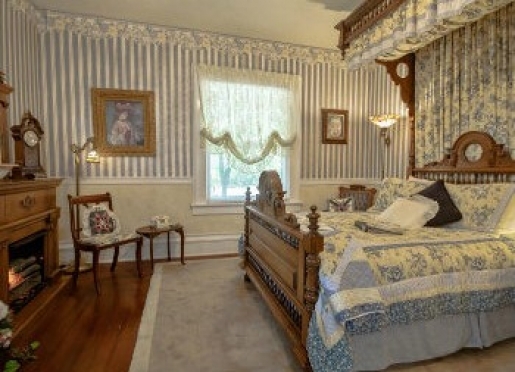 As a Springfield area bed and breakfast, this majestic home invites you to step back in time. From the first glimpse of this massive mansion, with its three foot diameter columns and intricate woodwork on the widows walk directly above the beveled glass front entrance, you feel that you have entered an era that has long since passed. 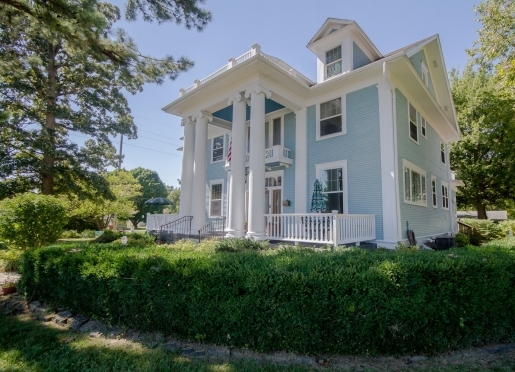 The Dickey House bed and breakfast is a lovely and gracious Greek Revival mansion offering a variety of Missouri accommodations in Marshfield, Missouri. 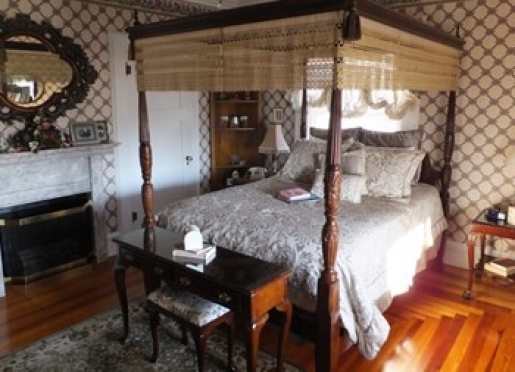 With well-appointed guestrooms, each with a private bath, beautiful gardens and gourmet breakfasts included in our rates, the Dickey House is an ideal alternative to Marshfield's typical hotel lodging. Located just 65 miles from Branson, Missouri, we are an easy day-trip to all of the exciting Branson attractions. In addition, our own lovely town has much to offer visitors in the way of activities and attractions. While in the area, be certain to visit The Town Square and The Hubble Telescope Replica, the nearby Buena Vista Exotic Animal Park, the Fantastic Caverns, Bass Pro Shop and our local antique stores. 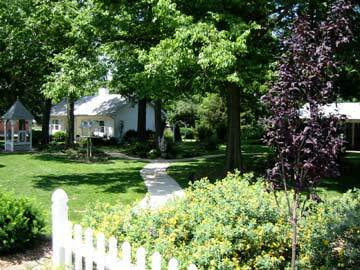 After your arrival you may wish to enjoy the outside lawns and gardens, studded with oak trees and benches. 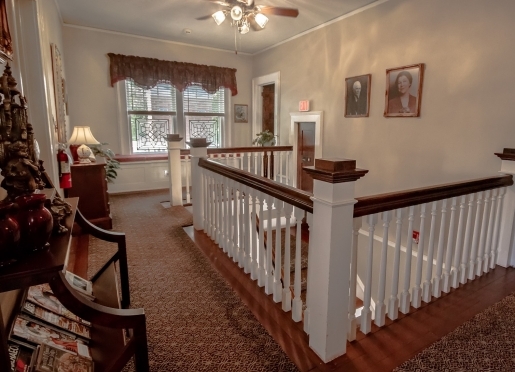 Or perhaps sit and enjoy the view of the garden from the swing or rocking chairs on the porch. 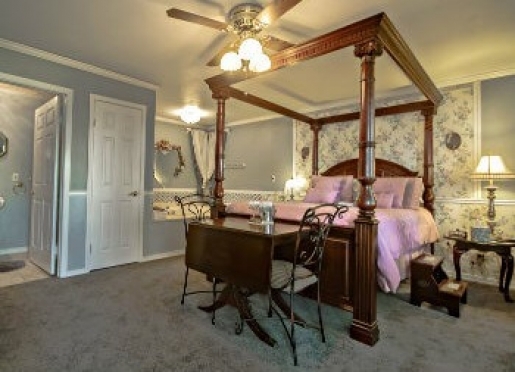 Or perhaps retreat to one of the seven guestrooms, each with a private bath. 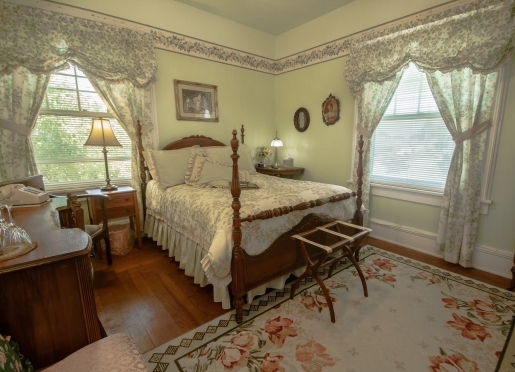 You'll step into rooms tastefully filled with antiques and reproduction furnishings. Your comfortable bedroom and modern bathroom offer a variety of distinctive touches that let you know you are indeed a special guest, and each room comes equipped with a TV and VCR. Travelers are always looking for memorable and relaxing experiences. Let’s discover more through the words of our innkeepers. Many thanks to Larry and Michaelene Stevens for sharing their own secrets with BBOnline.com! Most stay because we are just 1 mile off the interstate. Many snow-birders. 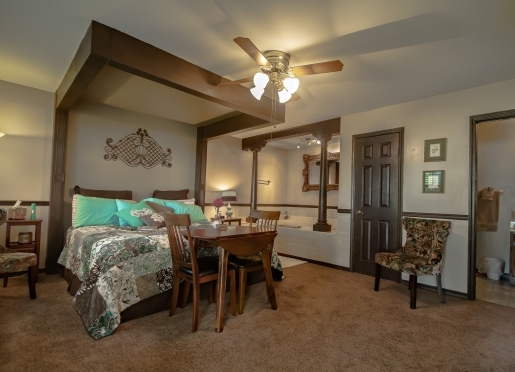 Most of the area folks, within 200 mile radius stay with us for a romantic get-a-way. We also have many “wedding night” stays and a few week long honeymoon stays. 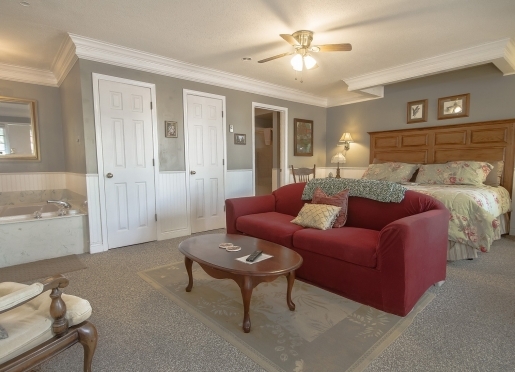 Our repeats say they stay because our beds are comfortable, every room/cottage is clean, and offers many amenities. 70% love the separate cottages. Our inn is unique as we do many weddings, small meetings, and have a working artists studio on our grounds. We offer several artist weekends during the year. The thing I like the most is the artist studio (being the artist) the stately Mansion and the beautiful gardens and grounds. It feels like home, only larger and more beautiful. The food is amazing. We are 50 miles from Branson, and have 4 lakes within a 30 minute drive. 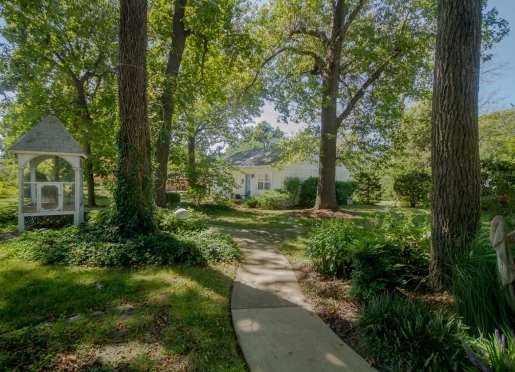 You can experience everything from the Small Town atmosphere to City Life to country living all within our area. Check our our website where we list many interesting things to do. See the flagship of the Bass Pro store -- 1 million (and growing) feet of space under roof. The National Fish and Wildlife Museum. Experience Fantastic Caverns, one of only 3 cavern systems in the world that you can drive thru. See Old Branson, and then pick a show to see. Visit Silver Dollar City and the water park, go for a hike in the beautiful Ozarks, swim, boat, or just stay at The Dickey House and relax. Our town square, the Hubble Telescope replica, our Hidden Waters Park, and a couple of antique stores. 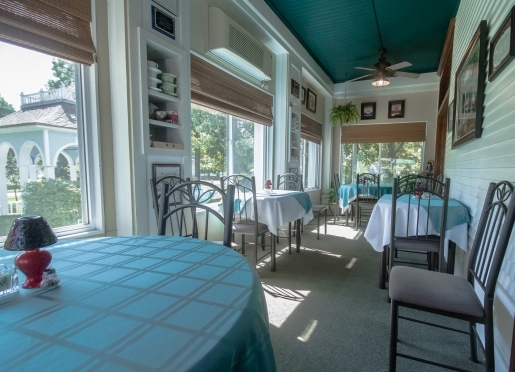 A new little family owned French Bistro (seats about 20) in Fordland, about 20 miles from us. The owners are from France and the food is amazing -- almost better than ours! Cozy, cooked to order, and very French. Fresh baked bread and pastries. Our local Chamber of Commerce located just off Interstate 44. They carry info from at least 10 states surrounding Missouri plus everything there is to do in the area and all of Missouri. Seven -- three in the Mansion and four suites on the grounds. We accept small dogs under 25 lbs only in our suites. Dogs must be caged at night or while you are away if you do not take the dog with you. There is a very nice pet motel, Bed and Bisquit, about 7 miles from us should you need to board a larger pet. No dogs are allowed in the Mansion as we have a resident dog, Ms. Taylor. 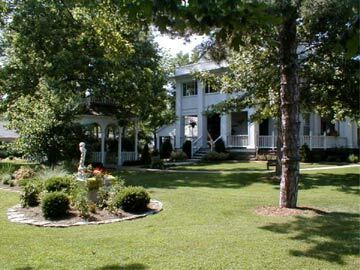 In addition to providing bed and breakfast accommodations, The Dickey House is also an ideal Missouri conference and meeting facility. 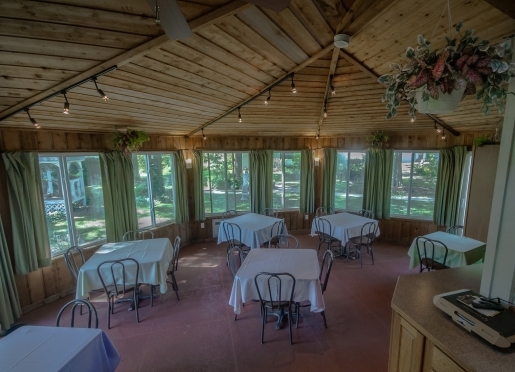 The Dickey House is available to host events such as small business meetings, corporate retreats, conferences, group luncheons, planning seminars, and club meetings or dinners. Our Banquet Facilities are available for meetings and conferences with up to 40 attendees. View our menu selections. 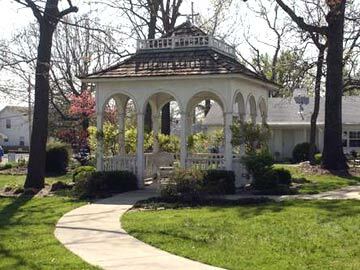 We are conveniently located in Marshfield, Missouri, just 22 miles from Springfield and 65 miles from Branson. 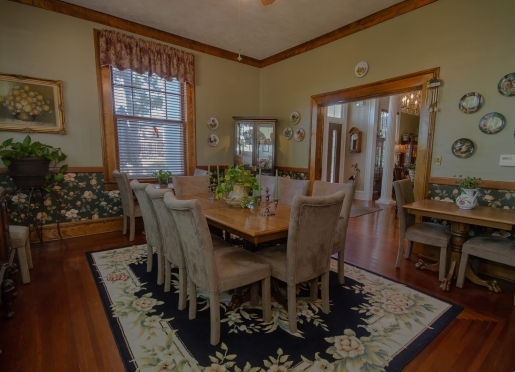 Each morning of your stay at The Dickey House, a Marshfield, Missouri Inn, you will enjoy a delicious, full gourmet breakfast. You meal will begin with coffee, tea, juice, fruit and fresh pastry. The second course is entree. 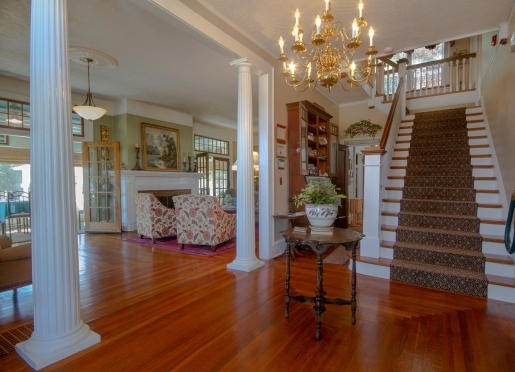 You will never get scrambled eggs and bacon at this Missouri B&B! All entrees are items that you would not normally make at home. For example: Bacon wrapped Asparagus served with a poached egg on a toasted garlic baguette and an Adobo Hollandaise sauce, A ham, mushroom, caramelized onion, cheese and egg stuffed braided pastry or even Dickey House Stuffed Pancakes. This is the inn’s Signature dish: two luscious pancakes are filled with sweetened vanilla cream cheese, then rolled, dusted with powder sugar and topped with whipped cream and our homemade raspberry sauce. 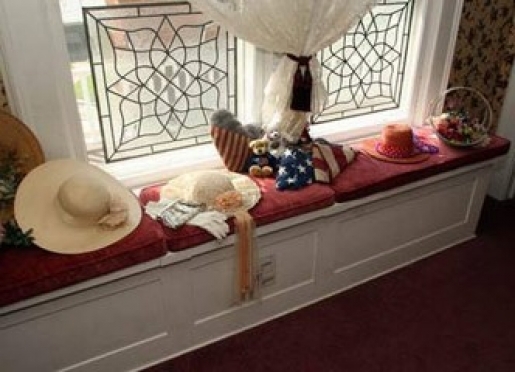 Breakfast is normally served at 9 am either in the dining room, which is on the formal side, or in the enclosed porch that overlooks the entire Dickey House property and gardens. 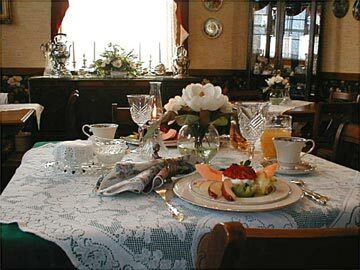 We will even make and pack a special breakfast for guests that wish to be up and on their way early. Other breakfast times may be arranged in advance, however we stop serving breakfast at 10 am. 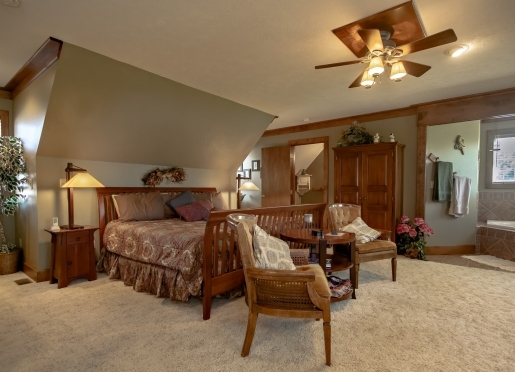 Below you'll find information on all the interesting things to do during your Missouri vacation at the Dickey House Bed & Breakfast. In addition to the inn's beautiful guestrooms and gourmet breakfasts, you won't want to miss exploring all that the area has to offer. Make plans for a day trip to experience Branson, Missouri's attractions or stay close by and explore our own town of Marshfield. "Visit Edwin Hubble's hometown and see the Universe from a different perspective."